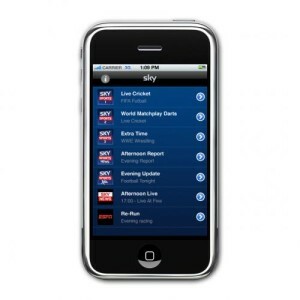 Sky news has introduced its app for Apple’s iPad known as Sky Mobile TV. Sky digital satellite TV had launched Sky Mobile TV back in last November for Apple iPhone and iPod touch, offers broadcast live Sky News and Sky Sports channels. Sky digital TV has made some changes in its Sky Mobile TV, in order to run the Sky Mobile Tv application on the large screen Apple iPad. That is officially launched in UK today. Apple introduces Sky Mobile TV application for iPad tablet and making possible for the Apple iPad users to watch live Premier League football on the tablet. Sky Mobile Tv application comes with electronic programming guide that shows the list of the available programs over the next 24 hours. Subscription fee for the existing Sky TV and Sky player TV customers for taking Sky Sports package of the Sky Mobile TV on iPad tablet is almost £6. The non Sky customers have to pay £35 a month in order to access the Sky Mobile TV services. Moreover, with one subscription of the Mobile TV, users can able to access the services of Sky TV services on both iPhone and iPad tablet. Sky digital TV channel offers three month free services of the Sky sports channel services for the Sky customers and for non Sky Subscribers who donot Sky sports will get one month free services of the Sky sports channel services. Sky news channel will be the first UK broadcasters to launch the Mobile TV feature on Apple iPad tablet. You will get the latest update latest news no matter where you are , about the Premier Football league, breaking news, test match cricket news, golf sports, and lots of other news. This will be only possible if you have the subscription of Sky Sports channel and with one subscription users are provided access across both iPhone and iPad tablet.